EACH JELLY ROLLS CONSIST OF 2 EACH OF 20 DIFFERENT FABRICS FOR A TOTAL OF 40 STRIPS OF COTTON BATIKS THAT ARE 2 1/2" X 42". 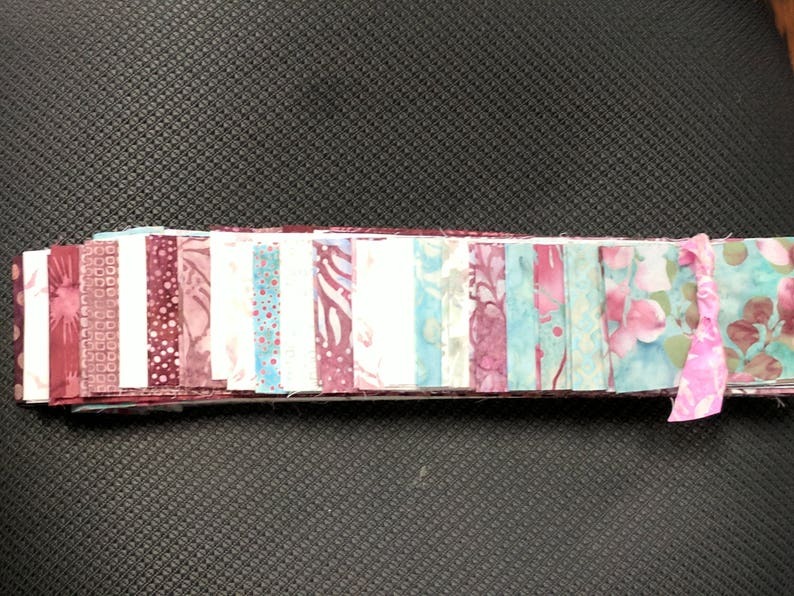 THESE ARE USED FOR QUILTING, BUT I OFTEN USE THEM TO CREATE MY 'JELLY ROLL' JACKETS THAT I SELL ON THIS WEBSITE. YOU CAN PURCHASE THE JELLY ROLL AND CREATE YOUR OWN JACKET USING MY INSTRUCTIONAL CD THAT IS AVAILABLE ON THIS SITE, OR YOU CAN CHOOSE YOUR COLOR AND ORDER A COMPLETED. JACKET. I HAVE INCLUDED A SAMPLE OF A COMPLETED JACKET IN 'FOREST'...... SEE MORE SAMPLES OF MY JACKETS ON THIS SITE.